STRONG SOLAR ACTIVITY: One of the largest sunspots in years, AR1944, has turned toward Earth and it is crackling with strong flares. So far on Jan. 7th, the active region has produced M7- and X1-class eruptions, and more appear to be in the offing. As this alert is being issued, analysts are waiting for more data from solar observatories to clarify the possibility of CME impacts and geomagnetic storms in the days ahead. 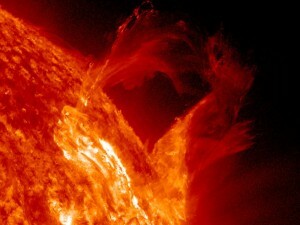 For updates, stay tuned to http://spaceweather.com. SOLAR FLARE ALERTS: Would you like a call the next time sunspot AR1944 erupts? X-flare alerts are available from http://spaceweathertext.com (text) and http://spaceweatherphone.com (voice). PreviousChips mandatory for all newborns in France and Europe Possibly by May 2014?